Disclaimer: You will note that I’m not talking of home studio vs professional studio: I’m well aware that a truly professional recording studio is not the same as using a shop/workshop-type space and turning into a studio-of-sorts, which is exactly what I did in San Sebastián. At no point was it set up to record other acts at a professional “commercial” level, which would be a venture of a different kind, requiring a technical know-how which I do not possess and a financial investment that would no make sense for the “unusual” solo recording musician that I am. For the purposes of this discussion, I’m talking about the possibility of opting for a workspace that’s outside the home, as opposed to having to make music inside your home – and even within those two ends of the spectrum, there are variations (dedicated space vs using a room that already fulfils another daily life purpose for instance). Of course a few people have the luxury of having a professional-grade studio inside their home, but they are so few and far between that I’m not really thinking of them here! Also, my reasons for *not* recording in a professional studio are beyond the scope of this discussion, but even if I did record in a professional studio, I would still need a place to *make* music. I would like to go back in time and share a bit more about where and how I recorded my first three albums. The Colleen project was born during my two years preparing the agrégation d’anglais in Paris and then completing teacher training: borrowing records and trying to make music using software on a computer I’d bought the previous year to write my master’s thesis were the only two things I allowed myself during that time. I lived in a 17 m2 studio flat in the XVème arrondissement, and “Everyone alive wants answers” was born in that tiny space. When I got the opportunity to do my first shows, I immediately felt like reconnecting with the guitar, and I had by then developed a strong interest in musical instruments from various time periods and geographical areas. With my teacher’s salary, I started to gather a few instruments and sampling pedals, and the studio flat became very crowded indeed. The year after the release of my first album, I found a 40 m2 flat – a luxury in Paris for a single person, and when I started to make music in the tiny living-room, it could have been Versailles as far as I was concerned! I recorded all of my second album “The Golden morning breaks” in that living room, with gear of extremely poor quality, but it somehow worked out perfectly for the sound I was looking for. 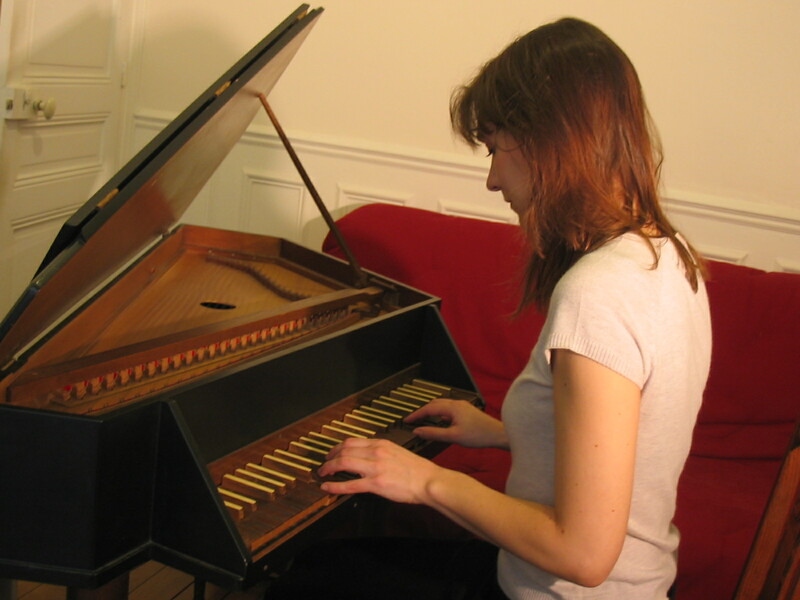 However, when I switched to the bass viola da gamba – by far the best quality instrument I’d ever owned – for ”Les ondes silencieuses”, I was faced with the blatant problem of a discrepancy between how great the viola sounded in itself and how poor it sounded when I tried to record it with my very limited gear and technique. Mastering engineer Emiliano Flores, who is also an apt recording engineer, came to the rescue and – interestingly for the purposes of this discussion – he proceeded to record me playing a great deal of “Les ondes” in the attic at his parents’ house in the suburbs of Paris – so again, not a professional studio space by any means. I took notes of the mike placements he was using, and he sold me the mike I still use to this day on all my albums, along with a good preamp. I was then able to record the rest of the album at home, mostly parts that needed more layering and/or improvisation, or the spinet song (I got a harpsichord player to rent me a spinet for a month – this is the picture that you see, taken by Iker Spozio as part of the study material for the album’s artwork). By now you’ve probably understood how intimate the whole recording process is for me, and I became determined to learn enough to *not* have to rely on someone else’s expertise again if it could be avoided. But while the lack of space, of intimacy (this became a big one when I decided to try to learn to sing in early 2010!) and fear of disturbing my neighbours were three real problems in Paris, they weren’t the biggest: CONCENTRATION was. By 2008, even though I had stopped teaching in 2006, I was chronically stressed out through overworking, problems with the label that released my records, and an overwhelming, neverending administrative and email burden. I would start making music, but the urge to check emails to see if something had arrived, been sorted, etc, was just too strong. I have told this story in an even more detailed way in two longs posts published on my blog years and years ago (here and here), so won’t repeat it here, but will just mention again that it was during stone carving lessons, reflecting on the way my teacher worked (in a garden, from more or less 8 am till 8 pm, with – obviously – no computer in sight) that I finally understood that my biggest problem was indeed a concentration problem, and that I needed to get rid of all distractions, and build a new discipline for myself, within a new space. « REFLECTIONS ON THE SPACE NEEDED BY MAKERS, PART III: MOVING TO SAN SEBASTIAN AND THE PROS OF AN OUTSIDE-THE-HOME STUDIO SPACE + TURKISH INTERVIEW! You are currently reading REFLECTIONS ON THE SPACE NEEDED BY MAKERS, PART II: HOME STUDIO VS OUTSIDE-OF-THE-HOME STUDIO, MY PARIS EXPERIENCE AND THE LIMITS OF WORKING FROM HOME IN A NON-DEDICATED SPACE. at colleen.